Around 42.5% of the Singaporeans are classified as Buddhist by religion. Adherents of Buddhism are mostly by the Chinese majority ethnic group, although small minorities of Sinhalese and Thai Buddhists do exist as well. Chinese Mahayana Buddhism is the most prevalent form of Buddhism in Singapore. Sizeable communities following other traditions include Therevada and Nichiren Buddhism. The most well known representative of Buddhism in Singapore is Venerable Shi Ming Yi who is the abbot of Foo Hai Ch’an Monastery and Secretary General of the Singapore Buddhist Federation. He also works as the CEO of Ren Ci Hospital. The presence of Buddhism in Singapore was evident during the Srivijayan times. However, as Islam spread to the local Orang Laut population in the 14th and 15th century, the influence of Buddhism and Hinduism eventually waned and almost disappeared. 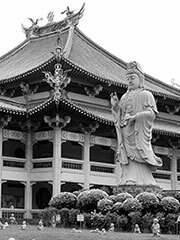 Buddhism’s revival in Singapore is a recent trend, although many of the Chinese inhabitants also mix in Taoism and other Chinese folk religions with Buddhist tradition. As shown, the percentage of Buddhist adherents have risen from 27.0% in 1980 to 42.5% in 2000. It was also noted that there is a significant increase of interest in the Buddhist teachings (Dharma) and practises (i.e Meditation). Ch’an Buddhism is especially popular in Singapore, with a sizeable majority of its adherents interweaving Buddhism with the Chinese folk religions. Especially true for the older generation, many will visit the Buddhist temples to pay homage to their ancestors on an annual basis, a tradition which is part of native Chinese practise. When a person passes away, their funeral is held in the void deck of the HDB flat. The Buddhist monks recite mantras and the names of the Buddhas for the deceased and the spirits, that they may receive merit and attain more favorable rebirths in the higher realms or the Amitabha Western Pure Land. The ashes are normally sent to Buddhist temples after cremation to be stored in urns. In recent years, the Theravada school, Nichiren Buddhism and Tibetan Buddhism have acquired sizeable followings. Monks from Sri Lanka, Thailand and other South-eastern countries have come to teach their form of the Dharma to the Chinese in Singapore. As a result, a number of Theravada and other Buddhist temples like the Sakya Muni Buddha Gaya Temple have sprung up in recent years. Nichiren Buddhism has also made significant inroads into the Buddhist community by Singapore Soka Association.The association, also known as SSA, is popularly recognised for their contributions to the nation’s Chingay street festivals, National Day Parades and for its recent with in the Indian Ocean tidal wave Indian Ocean Tsunami disaster relief operations. They do not worship in temples, but in their private-home shrines and community buildings known as , with eight constructed and located throughout the nation. SSA’s membership, initially of Chinese origin, currently hosts a multi-ethnic composition of Indians, Japanese, Eurasians and others. SSA also runs a with an international intake. However, in recent years, due to the increasing publication of Buddhist books, the appearance of internet sites in English, the availability of modern Buddhist music as well as courses conducted in English, more and more English-speaking Chinese, especially the young Singaporeans, are joining Buddhist circles. As a traditional Asian religion, Buddhism seems to be spreading back from the West to Singapore, as many of the Buddhist books are written by Western monks, sangha and writers (e.g., the Dalai Lama, Thubten Chodren, Tenzin Palmo). Singapore’s Buddhist temples and religious circles are highly organised and very often have a connection with foreign religious organisations, especially in China, Taiwan, Thailand, the USA, the UK, Sri Lanka, etc. Many foreign Buddhist associations and temples have also established branches in Singapore to propagate Buddhist teachings and activities. Buddhist temples and associations are spread all over Singapore, ranging from small to large. The largest Buddhist temple in Singapore, Kong Meng San Phor Kark See Monastery, holds many Buddhist activities such as chanting, meditation, retreats, and dharma talks, as well as offering Buddhist courses on dharma and meditation, very often attended by thousands of adherents. From the practice of many Singaporeans, there is the perception that Buddhism is about burning joss sticks and praying to Buddha. A typically fervent Chinese Buddhist will not just study Buddhism, but also practise the teaching in his daily life, such as meditation, practising mindfulness etc. He will also attend the various Buddhist activities (e.g., Om Mani Padme Hom Retreats, Insight Meditation) in the Buddhist circles and do volunteer work if necessary. He will normally celebrate Vesak Day and place a Buddha altar at home, paying homage to him daily. If he feels he would like to be an official Buddhist, he would normally undergo a religious ceremony in the temple known as ‘taking refuge in the Triple Gem’ (归依三宝).